Caring Staff, Who Love Kids! Emily Davies is a dual qualified Oral Health Therapist / Hygienist, educated at University of Melbourne. She is specifically trained to deal with dental issues for babies, children and youth up to age 25, and connects well with all children. It’s about talking to our younger patients on a level that they can relate to and understand. This way we help to get the best dental outcomes for the kids and their families. When seeing adult patients, Emily supports our dentists by undertaking the preparatory work such as charting and xrays, measuring the gum health, as well as taking time for a thorough clean. She gets outstanding feedback from patients with periodontal conditions, who have to have deep cleaning (scaling and root planing – SRP). Our other senior Oral Therapist, Mark Suniga also studied at Melbourne University, and is also a qualified dual Dental Therapist / Hygienist. Mark takes time with the treatment for you – and will discuss in depth with you the issues relating to your gums and teeth. Mark is the one to help with deep cleaning (or Scaling & Root Planing) to help address pockets or problem areas of periodontitis (gum disease). With his Dental Therapist hat on, Mark connects well with children and can take care of their dental needs; from infants through to 25 years of age. He can get most kids to do things that they never thought they would want to do. Sports mouthguards, fissure sealants and other treatments (either with private health insurance, or under the Medicare Kids Dental Benefit Scheme). All with a smile. He is a valued part of our team, helping supplement our dentists with treatments where he is more skilled. We are pleased to have Mark as part of our team 5 days a week. Hygienist / Oral Health Therapist Jessica Elliot – Sutton has been working as a Oral Health Therapist for over 6 years. She is originally from Melbourne, but trained in Perth. She is certified in Zoom Teeth Whitening. Her nature is calm, her hand very gentle, and she takes pride in explaining what is happening for each patient, in a way that makes sense to them. With kids she tends to get them onside, but maintain professional nature, while educating them on their level. 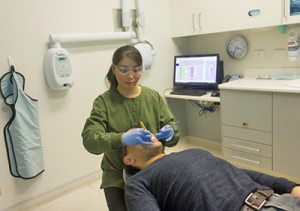 Michael Popp is a dual qualified Hygienist & Oral Health Therapist – who has a variety of interest outside of work, including travel and the Vietnamese language. A Melbourne native, he studied at University of Melbourne, and has a great nature with kids of all ages. His previous experience at a high profile city dental practice, helped foster his interest in gum health, and looking after the long term maintenance of patients with dental implants. Contact us today to arrange to see one of our team. They are looking forward to helping you and your family look after your smiles.